Professor of intercultural education and studies Leanne Dzubinski has developed a comprehensive list of barriers that women face in executive leadership due to their gender, which she found creates an unconscious gender bias in the workplace. In June, Dzubinski presented with colleagues on the latest findings from her research. Dzubinski has been working with Amy Diehl of Shippensburg University of Pennsylvania and Amber Stephenson of Clarkson University to research the impact of unconscious gender bias. Dzubinski and Diehl received the 2016 Outstanding Scholarship for Emerging Scholars Award from the International Leadership Association Women and Leadership Affinity group for their research. Their research is significant to the study of women’s leadership in two ways, according to Dzubinski. First, it is the only work to date that attempts to systematically describe and understand the constellation of challenges women leaders face, instead of looking at individual factors one by one. Second, it is the only work to date that compares and contrasts the experiences of missionary women with women in other fields. 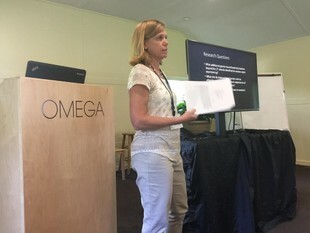 “By showing how missionary women’s experiences are both similar to and different from secular women, this research can help to dispel the prevalent myth that women in Christian mission organizations face greater challenges to leading; in fact in some areas they face fewer barriers,” said Dzubinski. Dzubinski and her co-researchers developed a survey based on Diehl and Dzubinski’s previous work identifying 27 barriers executive-level women encounter that hinder their ability to lead. The survey was completed by more than 1,000 women executives in mission organizations, higher education and healthcare. Preliminary results show that women in all three fields encounter the same barriers, though with different degrees of intensity. Some barriers are familiar to the field such as work-life balance challenges and the lack of mentoring or sponsorship for women; however, other barriers are less well known, according to Dzubinski. Together, the combined barriers create “unconscious bias” — a tendency to favor or dislike something without really thinking about it and in which the person is not aware the bias exists. Dzubinski states that bias helps people make sense of the world due to the amount of information humans take in each day, so the knowledge and information one already possesses helps create order out of new information; however, “unconscious bias” can be an issue. “Unconscious bias gets in our way because it adds a ‘slant’ to what we see and what we know, or what we think we know. Because bias develops out of our life experiences and our beliefs, everyone has it. Sometimes it is useful, but sometimes it actually hinders us from achieving what we want to achieve,” said Dzubinski. The presence of unconscious bias about women leads to the barriers and creates unique challenges for women in the workplace, according to Dzubinski. Research in this area will help contribute to positive change for both men and women at work. The project is ongoing and Dzubinski and her colleagues plan to continue speaking and publishing about their findings. They have tentatively identified a new barrier and hope to be ready to present the full picture at the 2018 International Leadership Association Conference in West Palm Beach, Florida.